Swan Lake, the Canadian super band, consisting of Spencer Krug, Carey Mercer and Daniel Bejar are set to release their 2nd album, "Enemy Mine" on March 24th from Jagjaguwar Records. Right now, if you pre-order the new album you can immediately download it in advance of the release date. 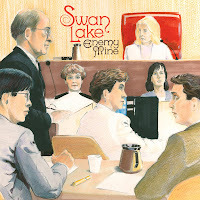 This week's 3 Songs feature includes one song from each contributor to Swan Lake from "Enemy Mine". Kid, You'll Move Mountains - "Loomings"